Website available in various languages! 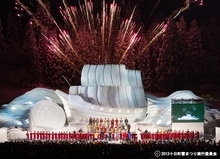 2011 marked the 100th anniversary of skiing in Japan...and Niigata is where it all started! 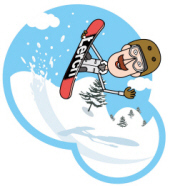 In January 12, 1911, Major Theodor von Lerch of the Austrian Army gave ski lessons to Japanese people for the first time on Mt. Kanaya in Takada-machi, Niigata (currently part of Joetsu City). Soon after this soldier training, people of the area began to ski for fun it is believed that this marks the beginning of the history of skiing in Japan. Niigata Prefecture is located on the main island of Japan, Honshu, to the north of Tokyo, stretching for nearly 250km along the coast of the Sea of Japan. The city of Niigata is the largest Japanese city facing the Sea of Japan and plays an important role in trade with other countries such as Russia and Korea. Niigata is divided into four main geographical areas: Joetsu (south), Chuetsu (center), Kaetsu (north) and the island of Sado off the coast. Niigata is one of the main ski and snowboard resort areas of Japan with over 50 operational ski resorts. The majority are located in the Myoko area of the Joetsu region and the Yuzawa and Minamiuonuma area of Chuetsu region, though there are other resorts dotted around the mountains of most areas of the prefecture. 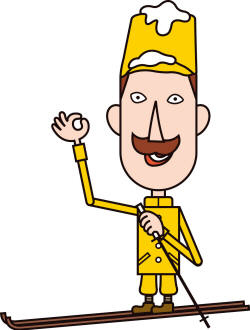 Just a few of the events happening in Niigata Prefecture during the winter months are featured below. 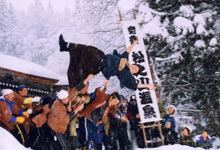 Known as a strange custom of traditional Niigata, ‘son-in-law throwing’ is a Lunar New Year tradition passed down for 600 years in the Yumoto community of Matsunoyama. After the local men who got married in the past year get thrown into the snow, visitors to the shrine can say their congratulations while they paint each others’ faces with an ink made of sacred ash mixed with snow. This simple festivity is done to pray for perfect health and family prosperity in the New Year. 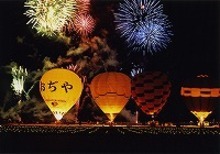 The “Sea of Japan Cup Cross Country Championship” hot air balloon competition complete with large colorful hot air balloons and fireworks makes for a dream-like event. You can even try riding in a hot air balloon at the event. 10 minutes by car to the Nishinaka location and 10 minutes by car to the Hirasawa location from the Ojiya IC on the Kanetsu Expressway. Niigata Prefecture offers large amounts of fresh snowfall each winter.... but there is much more to Niigata than the quality snow! Niigata is also known for producing what is known as the most delicious rice in Japan - 'koshihikari' - as well as also producing a number of famous delicious brands of Japanese sake and also hegi-soba noodles. Be sure to enjoy these when you travel to Niigata Prefecture! Niigata Prefecture is one of Japan’s several major rice producing regions. 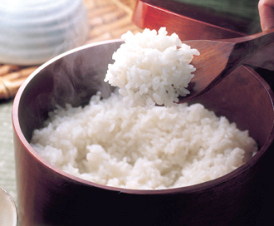 In the center of the prefecture, the Uonuma region is nationally famous for its crop of delicious 'koshihikari' rice. The secret of this area’s rice is the pure water from the melted snow in the Echigo Mountains caused by the region’s severe climate due to large changes in temperature. 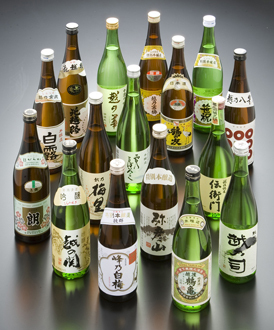 With about 90 sake breweries, Niigata is one of Japan’s leading sake producing areas. It is said that water is the key ingredient in making sake. The snow and rain that falls on the high mountains of Niigata soaks into the earth, forming springs and streams and eventually flowing into the rice fields. This water not only makes the sake delicious, but also enhances the flavor of the rice - the other main ingredient in sake making. Climate is also an important factor. The winter climate in Niigata is favorable, with the low temperatures that allow sake to ferment and develop. What makes these noodles unique is the use of top-quality buckwheat and funori seaweed as a bonding agent. The noodles, always cooked al dente and smooth, are served one mouthful at a time on a special plate called a hegi.